Your shift knob and your steering wheel (along with the pedals) are some of the most important control surfaces in your car. We believe these surfaces should not only look exceptional but perform and function beyond expectations. We offer shift knobs that are Original BMW parts, MOMO from Italy, and other brands that we feel make driving more enjoyable and enhance the technical sophistication that your BMW embodies. BMW shift knobs are easy to replace. On manual transmission models, the knob is pressed into a groove at the top of the shift lever. It simply needs to be pulled off - place the transmission into 2nd gear and yank hard towards your chest (not your head). 2nd gear offers a better leverage point than anything else. To install the new knob just slide it over the shift lever and press down firmly. You will feel the knob 'snap' into place. Note that some factory knobs are a one-piece design with the boot. Upgrading your knob may require a new boot as well. This Genuine BMW shift knob is about 3/4" shorter than the "standard" shift knobs and is weighted (5.4oz) to give a better, more substantial, shifter feel for the driver. We love the subtle, yet noticeable improvement this makes in the "feel" of gear changes. It's also identical in size/shape/weight to the shift knob that came on the E46 330 ZHP, and is available in either 5 speed or 6 speed gear shift patterns. Perhaps best of all, this shift knob fits ALL 1982 and newer manual transmission BMWs. That's right -- this knob can be used on ALL BMWs, 1982 and later. So no matter what model BMW you have -- E30, E36, E46, E90 or E92 or anything else -- this knob will look, work, and feel GREAT. This knob also looks and works great on all 1 series including 128i and 135i. Note that many newer models have a 1-piece knob + boot. This is standard on most M cars and on some other BMWs. We sell new replacement boots to use with this shift knob, choose the option below if you would like one included with your order (not for E9X M3 models). Improve the looks and feel of your shifter with the ZHP 6-Speed shift knob from Genuine BMW! Considered by many to be the nicest shift knob ever produced by BMW. This Genuine BMW manual shift knob fits all 1982 and on BMWs. It "snaps" onto your shifter level just as your stock shift knob does, and can be installed in a matter of seconds. This knob is much shorter and smaller than the "standard" knobs, and is weighted for better shifter feel. Available with your choice of either 5 speed or 6 speed shift pattern (select your option below). Note that many newer models have a 1-piece knob + boot. This is standard on most M cars and on all cars that have an illuminated shift knob. We sell new replacement boots to use with this shift knob, choose the option below if you would like one included with your order (not for E9X M3). This is a genuine BMW 5-Speed ZHP shift knob that is weighted and styled to improve the look and feel of your shifter. This Genuine BMW leather shift knob and boot originally was fitted to the F10 M5 but has been a popular mod for E46 M3 owners. The electric connector is the same as the E46 M3. The M5 shift boot will fit on the E46 base frame but may need to be trimmed some because it is 15mm longer or the boot may be completely removed. This Genuine BMW shift knob is the same height as standard shift knobs - and 3/4" taller than the the "shorty" ZHP shift knobs - and is weighted (5.4oz) to give a better, more substantial, shifter feel for the driver. We love the subtle, yet noticeable improvement this makes in the "feel" of gear changes. 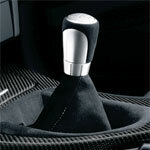 It is available in either 5 speed or 6 speed gear shift patterns. This shift knob fits ALL 1982 and newer manual transmission BMWs including E30, E36, E46, E90 E92 F30 F32 etc-- this knob will look, work, and feel GREAT. This knob also looks and works great on all 1 series including 128i and 135i. Fits ALL manual transmission BMWs from 1982 through present. Please choose your desired shift emblem below. Black leather shift book directly from BMW for the E46 BMW. Great for a replacement or to upgrades the looks of your interior. Customize your E46 with this illuminated shift knob and leather boot directly from BMW. This will help give your interior a sportier look and feel. This is the OE shifter for the E46 325xi and the 330xi (up to 03/2003) and the E36 Z3 1.9 and 2.5. The shift lever out of the Z3 1.9 delivers a smooth and quiet shift without the notchiness and effort of aftermarket short shift kits. The Z3 shifter in the E30 is approximately 20% shorter than the original E30 shifter - less reduction than a full short shift kit but the perfect compromise between stock and aftermarket. We have installed multiple shift levers in the E30 but the Z3 1.9 feels the best to us. The shift knob height is reduced by about 1/4". This is the Genuine BMW Z3 1.9 shift lever and a direct fit to 6/86-1992 E30 318i/is, 325e/es, and 325i/is. E30 install note: there is a bowl-shaped vibration damper mounted with the transmission flex disc (guibo). This damper needs to be removed or you need to bend the stock selector rod so it will clear. Most E30s already have the vibration damper removed so don't be surprised if it's not there. If you do choose to remove it, this would be the perfect time to replace the flex disc. On some 325e models the flex disc is a larger diameter and the selector rod will need to be bent to clear it. This manual transmission shift boot is made from Alcantara that will greatly improve the looks of your shifter! This can be used with all E46 vehicles with a manual transmission.